Clean the beaches today for a better tomorrow! We comprise of an independent group of individuals who agreed to set up an initiative to clean our beaches. 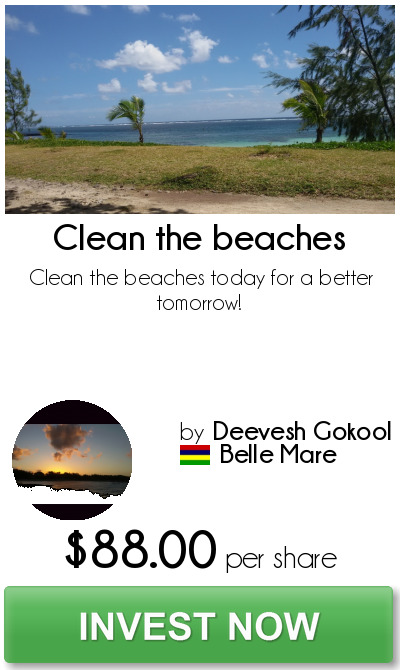 We are based in Belle Mare and we commit ourselves to clean up at least 3 times per week. We need funds in order to restore the natural beauty of our landscape. We will be able to also buy better safety equipment for our members. If our project is succesful then we will start advertising and try to get more people in our team. I was a member of National Institute for Civic Education where I learnt how individuals can help in their own way to improve our country. I succeeded to gather a few volunteers for now and we look forward to increase our team members. We are strictly committed to what we are doing and we hope one day we will be able to see the original beauty of our beautiful beaches.